In recent years, architects have been searching for solutions to increase the flexibility in auditoria, entertainment venues, community halls, and theaters. There are several driving forces behind this industry evolution – offering multiple uses within the same performance space can lower overall operating costs, reduce labor time and expense, and increase artistic possibilities. For this kind of flexibility to work and be accepted, speed of transformation, safety, ease-of-use and reliability have to be the norm. SERAPID has many years of experience in the provision of flexible solutions for theaters, conference halls and arenas. As an engineering-based company, SERAPID approaches each venue with an eye to providing the most efficient solution to achieving the artistic vision. These solutions have been designed to reflect the level of flexibility required in light of the available budget, and include a number of options. One basic option based on SERAPID LinkLift technology utilizes lifts in conjunction with seating wagons. This provides a reasonably efficient system, but requires higher labor levels and provision of a storage area for the seating wagons when they are not in use. This storage area normally has to be around 25% bigger than the wagons themselves. The other limitation is that the rake is fixed – however, this system can accommodate any type of seat. Alternatively, a series of lifts combined with loose seating can be used. This will require more lifts than the seating wagon system, but less storage space is required for the seats themselves. The choice of seating type is limited and the transformation is fairly labor intensive. Another option is comprised of individual seat row lifts combined with folding seats stored in boxes. When stored, the box lids form the floor, which can then be easily configured to raked or cabaret arrangements by fully automatic, semi-automatic or completely manual means – once again, the level of automation is dependent upon budget. The major benefit of this system is pit depth. If the seating rows can be guided using linear wall guides at the ends, then pit depths of as little as 750mm (2.46ft) can be achieved. 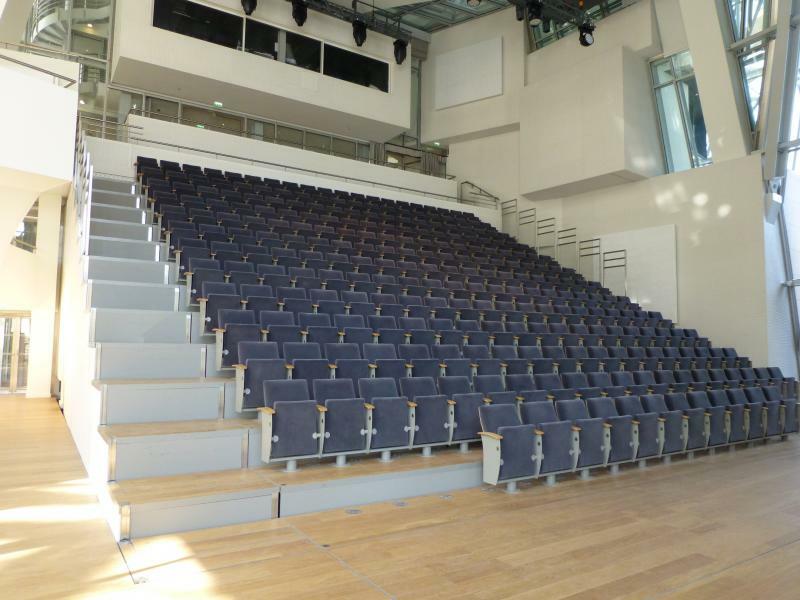 The Dorfman Theatre in London was fitted with this type of system, with semi-automatic seats. The Dorfman system has 140 seats and a full transformation can be performed by a single person in about 60 minutes. In addition, by removing some of the seating boxes and lightweight gratings on top of the elevators, trap positions are provided. The forestage lift, which is double the depth of the remaining nine rows, can be used to transport seating wagons from storage. These are used at the rear auditorium to provide additional seating when the sound-mixing position is not required. The biggest limitation of this system is that the choice of seat is restricted to folding models. 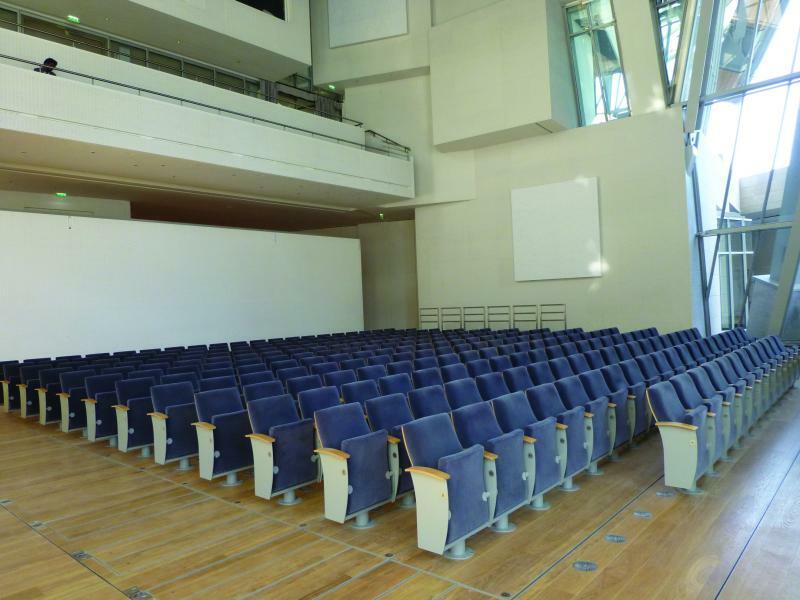 For companies developing flexible solutions for performance venues, the ultimate objective has always been the development of a compact, fully automatic and cost-effective system that enables the transformation of curved rows of seating. After a number of years of intensive design and development work, SERAPID has produced QSX II, a patented solution that provides the ultimate level of automation and flexibility. The system allows for the storage of rows of seating directly below the floor; this can be deployed with the simple push of a button – requiring only a single individual to complete the transformation of a complete venue. The system works with both straight and curved rows. The QSX II seating system uses a unique parallelogram arrangement combined with SERAPID’s LinkLift lifting solution. As opposed to other systems, which turn the seat upside down, with the QSX II system the seats are stored in an upright position, firmly planted on a steel section mounted on a set of arms, ensuring a rigid structure free from deflection. These steel sections accommodate any type of seating, enabling total architectural freedom. Alternate rows are simultaneously raised using the SERAPID LinkLift system, so that the stored seats are clear of the adjacent floor sections. Once fully raised, the parallelogram system swings the seats out from their storage position, clear of the floor structure, and then positions the row. Once this motion has been completed, the sections are simultaneously lowered to flat floor level. The next sections of floor are then raised and the sequence can be repeated. After the seats have been positioned, each section of floor is raised to the desired level if a rake is required. A series of rakes can be pre-programmed into the system for different requirements. The QSX II system is fully synchronized, retains its position regardless of number of cycles, allowing precise and uniform gap control. It requires only a shallow pit depth of as little as 1,800mm (5.9ft), and eliminates the need for a separate storage area, minimizing the impact on the building volume. The construction of the floor and seating mechanism permits controlled distribution of heating and cooling. The design of the system also enables power and communications to be brought direct to each seat, making simultaneous translation, voting systems, lighting and similar features possible. SERAPID has been involved with all these solutions and is ideally placed to advise and help with the provision of systems to provide a level of flexibility to fit a wide variety of budget levels.